Sri City, August 27, 2018:- Sri City has added another feather to its cap of impressive accolades by winning prestigious awards from the World Consulting and Research Corporation (WCRC) International, the World’s leading brand equity research and consulting firm, at the 3rd edition of WCRC’s IDEASFEST-2018, held at the Sahara Star Hotel, Mumbai on Monday night. 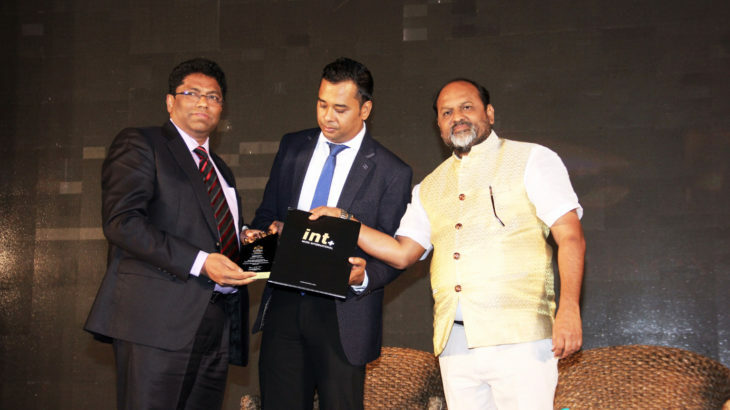 Mr. Ravindra Sannareddy, Founder Managing Director received the ‘Inspirational Leader-2018’ award and the ‘Iconic Brand Rising Star-2018’ award from Mr. Mahadev Jankar, Minister of Animal Husbandry, Dairy Development & Fisheries Development, Government of Maharashtra, in the presence of Mr. Kinshuk Gupta, COO, WCRC. While the ‘Inspirational Leader’ award was bestowed on Mr. Ravindra Sannareddy for his unique leadership style, unprecedented enthusiasm, diversified business creativity, personal and professional integrity as well as remarkable team management skills, Sri City was adjudged as ‘Iconic Brand Rising Star’, as it imprinted its authority by virtue of its pristine credibility, enormous customer following and high standards adopted to emerge as a leading business city. The prolific event was organised to recognise and felicitate India’s most trusted CEO’s and the iconic brands of the year, and to rejoice the spirit of inspirational leaders who constantly demonstrate the desire and aptitude to earmark their presence with outstanding and distinguished contribution to the economy at large. Corporate leaders from different sectors, CEOs of some of the famous, viz Max Bupa, JWT, TTK prestige, Bajaj Alliance, Red FM, Himalaya group, Apollo hospital, Avanthi Group to name a few, many more entrepreneurs and luminaries of marketing, advertising, attended the colourful event.